The Eaton PT18M-W-K 1800-Watt 15-Amp 125-Volt ACCELL 5-Button Minute Timer with Auto- Off is an easy-to-use countdown timer that can simply replace a standard switch. It operates by simply pressing the desired time button and the device turns on. After the selected time has expired, the device will automatically turn off. It features LED indicators that change during the countdown to visual indicate how much time is remaining. This product is idea for bathroom exhaust fans, garage lights, and outdoor lights. 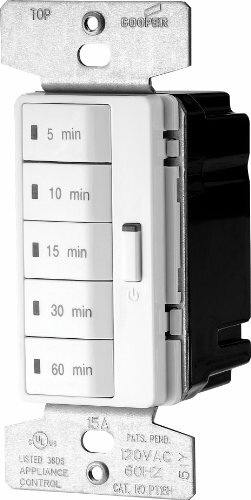 It comes with an override off button that allows you to easily bypass the timing function and turn the power off immediately. The product is designed to be used in 15-amp, 120-volt, and single-pole applications and is rated for 1800-watts. It also has a horsepower rating for ¼-HP motor loads. The Eaton PT18M-W-K 1800-Watt 15-Amp 125-Volt ACCELL 5-Button Minute Timer with Auto- Off compatible with Incandescent/Halogen, Magnetic Low-Voltage, Electronic Low-Voltage, Fluorescent/Compact Fluorescent, and LED light sources. Eaton is committed to providing products that increase productivity, energy efficiency, safety at work and in the home, and produce reliable performance. Whether a home's style is traditional, modern, casual, cozy or rustic, it will demand more from wiring devices than in years past. Eaton is dedicated to providing the up-to-date wiring device solutions that today's homes need.